Ask fellow campers about "Niobrara State Park" and nearby attractions. .Very nice park...easy in & out. Road paving in progress but not an impediment. We camped at Niobrara State Park in a Motorhome. This was a winter rate is per night for a 50 amp electric only site. In addition, there is daily parking permit of $5 or an annual one for $25 but it’s good for only the calendar year. The campground has padded level sites with trees between most sites. 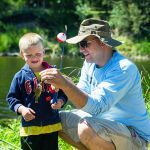 The campground is located at the confluence of the Missouri & Niobrara Rivers in a sparsely populated area with very limited dining and shopping opportunities. Spacing between sites is generous. There are miles of hiking/biking trails. OTA TV reception was limited to three PBS stations. We received five bars of Edge on our AT&T phone. We used our Millenicom jetpack as a Wi-Fi hotspot, but it wasn’t very speedy. We camped at Niobrara State Park in a Motorhome. State Park located in NE Nebraska. RV sites have paved pads. Good access for big rigs. All sites are back in. Pay showers are available (2 on each side). We camped at Niobrara State Park in a Fifth Wheel. An amazing state campground at the confluence of the Niobrara River and the Missouri River. Great views of the rivers. Picnic areas and tent camping areas near the river. The showers were 'pay' so take quarters with you. The $18 rate did not include $5 per vehicle Nebraska Parks fee so we payed $28. We camped at Niobrara State Park in a Motorhome. This is a very nice campground within beautiful Niobrara State Park. The sites have electrical only, but water is available and the dump station is well setup. Some sites have shade, but most are sunny although small trees dot the grassy campground making for a nice feel. The park itself is a nice place to drive around in and there are several hiking trails. One trail includes going across the Niobrara River on an old, unused railroad bridge. We took lots of pictures. The staff is very friendly and the park well maintained. We'd come back if ever in the area again. We camped at Niobrara State Park in a Motorhome. Beautiful State Park in north central Nebraska. Great facilities, quiet. Casino nearby on the reservation with cheaper fuel too. We camped at Niobrara State Park in a Motorhome. Niobrabra is a gem of a park and the best of six or so I have stayed in Nebraska. It is located overlooking he confluence of the Missouri and Niobrabra rivers. The vistas have a one way narrow gauge road system to enable bicycles and small cars to enjoy the breeze and the wonderful views. Our stay was to short to fully experience the surrounding area, but the park offers equestrian rides by reservation through acres of beautiful grasslands overlooking the best scenery Nebraska has to offer. It has an RV section, a smaller primitive RV section without services and places for tents and group camps. There are also large and what looked to be modern cabins available for rental. It is a bit off the beaten path, but the road (State HWY 12) is good all the way to the park and although narrow would service a large rig. On our way out we also found a casino about 10 miles East on the Santee Indian Reservation. We camped at Niobrara State Park in a Tent Trailer. 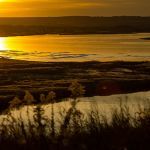 Are you affiliated with Niobrara State Park ?